For other uses, see Theater of War (disambiguation). In warfare, a theater (US English) or theatre is an area or place in which important military events occur or are progressing. A theater can include the entirety of the air, space, land and sea area that is or that may potentially become involved in war operations. "Denotes properly such a portion of the space over which war prevails as has its boundaries protected, and thus possesses a kind of independence. This protection may consist in fortresses, or important natural obstacles presented by the country, or even in its being separated by a considerable distance from the rest of the space embraced in the war. Such a portion is not a mere piece of the whole, but a small whole complete in itself; and consequently it is more or less in such a condition that changes which take place at other points in the seat of war have only an indirect and no direct influence upon it. To give an adequate idea of this, we may suppose that on this portion an advance is made, whilst in another quarter a retreat is taking place, or that upon the one an army is acting defensively, whilst an offensive is being carried on upon the other. Such a clearly defined idea as this is not capable of universal application; it is here used merely to indicate the line of distinction." Theater of operations (TO) is a sub-area within a theater of war. The boundary of a TO is defined by the commander who is orchestrating or providing support for specific combat operations within the TO. Theater of operations are divided into strategic directions or military regions depending whether it's a war or peace time. 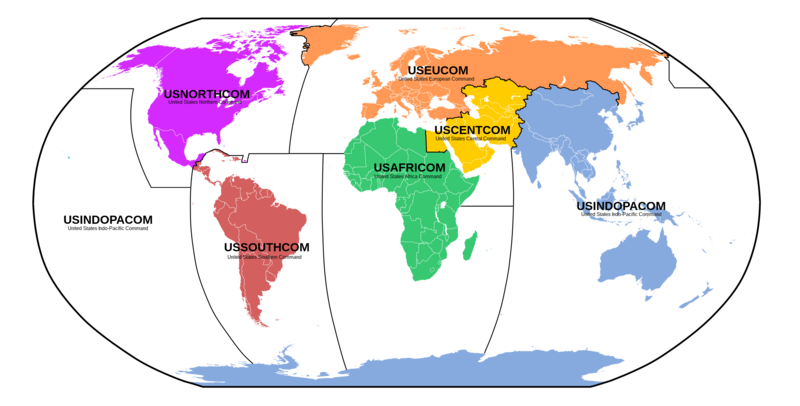 The United States Armed Forces split into Unified Combatant Commands (regions) that are assigned to a particular theater of military operations. Strategic direction is a group of armies also known as task (field) forces or battlegroups. Also in the US Armed Forces the term of strategic is often associated with missile command (troops) dropping word missile out of use such as the United States Strategic Command. However it is an important strategic command that could be effectively deployed in any theater of military operations. A strategic command or direction in general essence would combine a number of tactical military formations or operational command. In modern military, a strategic command is better known as a combat command that may be a combination of army groups. For example a large geographic subdivision used by the Soviet and Russian Armed Forces to classify the continental geographic territories with their bordering maritime areas, islands, adjacent coasts and airspace. The division of large continental and maritime areas assists in determining the limits within which the plans for operation of strategic military groups of forces are developed, allowing conduct of military operations on specific significant strategic directions known as fronts which were named in accordance to their theater of operations, for example Southwestern Front (Russian Empire), 1st Ukrainian Front, Northern Front (Soviet Union). In a peacetime due to loss of a strategic direction fronts were transformed into military regions (districts) responsible for an assigned section of operations. The Russian term is театр военных действий, teatr voennykh deistvii, abbreviated ТВД, TVD. The term "theater of operations" was defined in the [American] field manuals as the land and sea areas to be invaded or defended, including areas necessary for administrative activities incident to the military operations (chart 12). In accordance with the experience of World War I, it was usually conceived of as a large land mass over which continuous operations would take place and was divided into two chief areas-the combat zone, or the area of active fighting, and the communications zone, or area required for administration of the theater. As the armies advanced, both these zones and the areas into which they were divided would shift forward to new geographic areas of control. ↑ "Definition of theatre noun (MILITARY) from Cambridge Dictionary Online: Free English Dictionary and Thesaurus". Dictionary.cambridge.org. http://dictionary.cambridge.org/dictionary/british/theatre_4. Retrieved 2011-08-31. ↑ 2.0 2.1 "Theater (warfare) - definition of Theater (warfare) by the Free Online Dictionary, Thesaurus and Encyclopedia". Thefreedictionary.com. http://www.thefreedictionary.com/Theater+(warfare). Retrieved 2011-08-31. ↑ "Carl Von Clausewitz, On War". Clausewitz.com. http://www.clausewitz.com/CWZHOME/VomKriege2/ONWARTOC2.HTML. Retrieved 2011-08-31. ↑ "Chapter VII: Prewar Army Doctrine for Theater". History.amedd.army.mil. http://history.amedd.army.mil/booksdocs/wwii/orgadmin/org_admin_wwii_chpt7.htm. Retrieved 2011-08-31. Clicking onto image/diagram creates enlargement.